Southmoor Golf Club in County Durham has converted to biomass heating with a Windhager woodpellet BioWIN boiler to reduce energy bills and improve its carbon footprint. A 60 kW BioWIN Excel is providing heating to the clubhouse and surrounding buildings, replacing an old and expensive oil heating system. Peter Johnson, secretary of Southmoor Golf Club, initiated the change to biomass having recognised the benefits of cheaper fuel bills and the RHI payments. A quick installation with little disruption was carried out within a month and the switch to greener energy could see the club saving as much as £10,000 a year. Club secretary, Peter Johnson, sought an alternative way of heating as the existing oil system was old and expensive, entailing a large annual fuel bill and with repairs becoming more frequent the cost of maintaining and running it were only set to escalate. After looking into sustainable energy options including ground and air source heat pumps and solar panels, biomass was recommended for the additional benefits the business would gain. It was vital to find a more sustainable energy source that could deliver the same high standard of heating for the 400 members that regularly use the facilities. 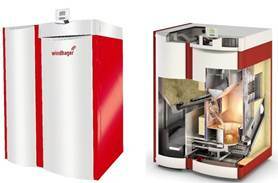 Windhager’s biomass boilers enable the user to closely control the boilers’ outputs through easy to use monitoring technology, allowing the system to be finely tuned to the specific requirements of the club. Peter Johnson commented on the biomass installation, “We were up and running by the end of January and submitted our first reading to Ofgem in mid-February. It’s a win-win situation for everyone. Members are delighted that we are saving operational costs and attracting income that can help maintain the course. I do think that in the current financial climate all golf clubs need to be looking at any cost saving schemes such as this”. After consultations with Windhager approved installers Nu Heat North East, and financial help from one of the golf club’s members, a Windhager BioWIN Excel 60 kW woodpellet boiler was installed with associated pipe work running underground to the clubhouse cellar where it could be connected to the existing heating system. The ladies trolley shed and part of the pro-shop was annexed to house the woodpellet boiler and the 10 tonne capacity pellet storage bunker, in turn saving the club money by not having to erect a new structure purely for this purpose. Maintenance requirements are significantly reduced with the BioWIN Excel’s option of an automated pellet feeding system and stainless steel combustion burner bowl that has a patented cleaning mechanism, removing much of the necessity for manual upkeep. Its compact design enables the BioWIN Excel to be installed in the smallest of boiler rooms while the pellet storage area’s flexible requirements allow a variety of buildings to be adopted. The golf club will submit quarterly readings online to regulators Ofgem under the RHI scheme which will see them receiving payments for the amount of energy produced by the Windhager biomass system. Southmoor will save in the region of £10,000 a year due to the combination of lower fuel costs and RHI payments meaning the initial loan for installation will be paid back in 5 – 6 years and then a further 14 years of RHI income can be enjoyed, with the freedom to invest in improvements to the 18-hole heathland course to further benefit the members.